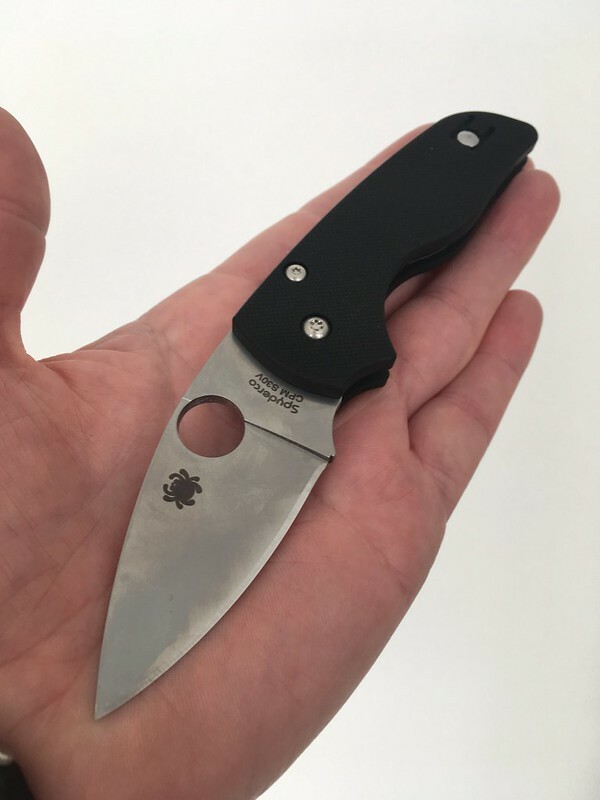 When I was visiting Nemo in Paris he offered me the opportunity to try out his Spyderco Mantra 2. 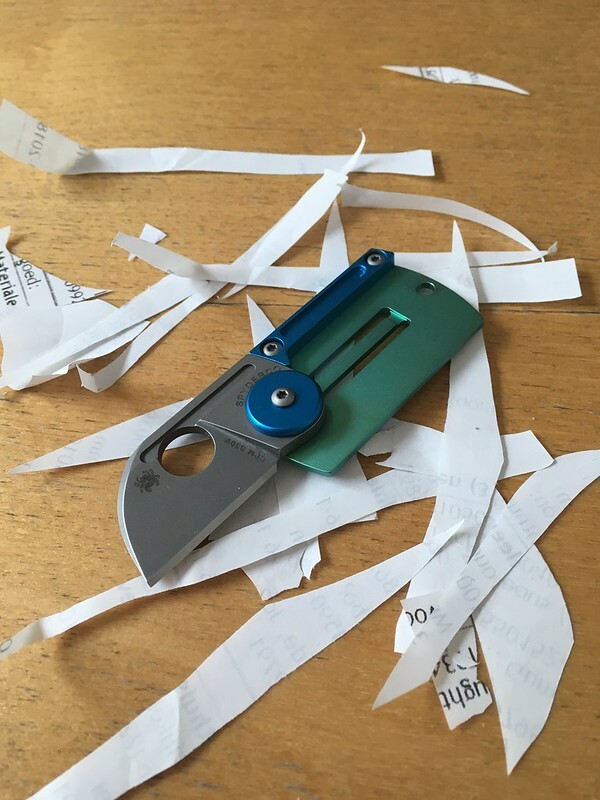 I have handled this knife before and of course have read Nemo’s review of this folder. I was interested in finding out how it would work for me, but not interested enough to buy one for my self. So Nemo’s offer was very welcome! 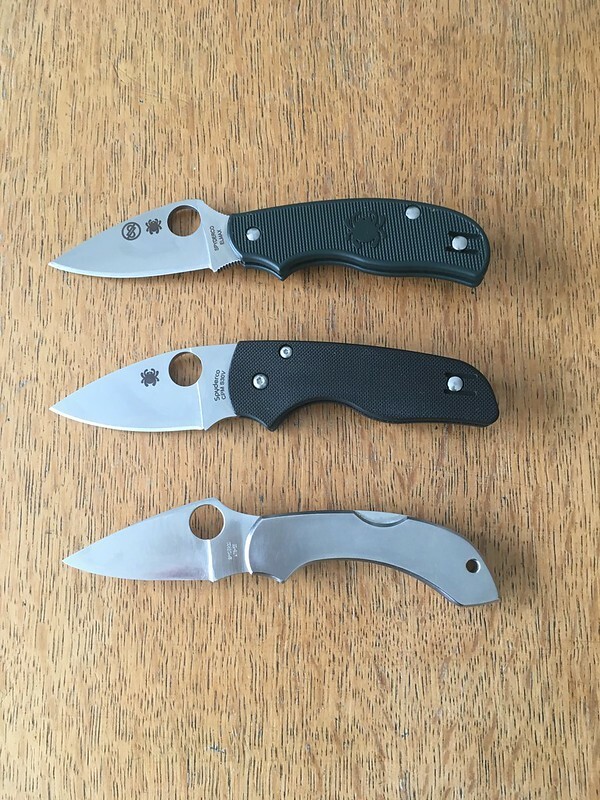 I have carried a few flipper knives in the past, a Buck Vantage and a Spyderco Domino. 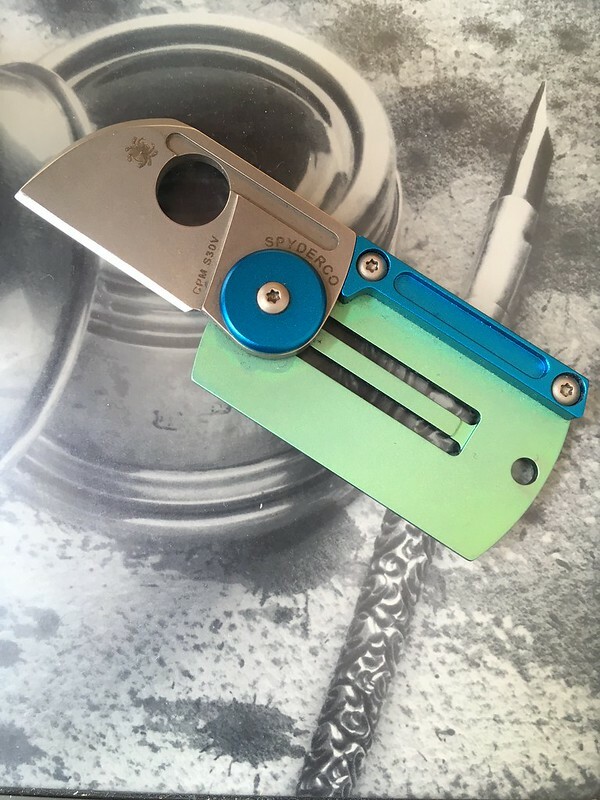 The Buck was a great cutter but not a great flipper and the handle didn’t really work for me. The Domino is high quality knife that cuts well and I liked the handle. Nemo and I wrote reviews of it a few years ago. (You can find it here.) After a few weeks I found it to heave and big in the pocket and I stopped carrying it. One of the things I learned from the Domino and other frame lock flippers is that with manny of them you have to be careful where you place your fingers. 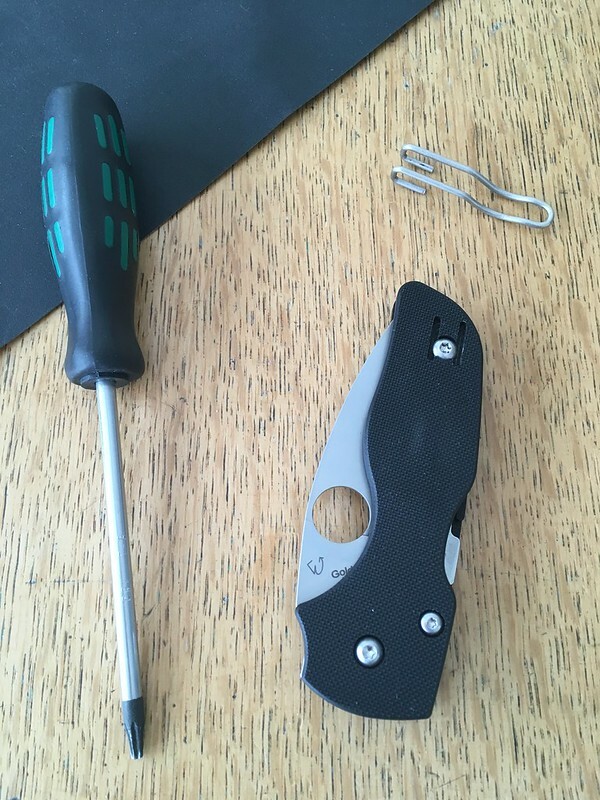 A little pressure on the lock bar can stop the flipper from working well. 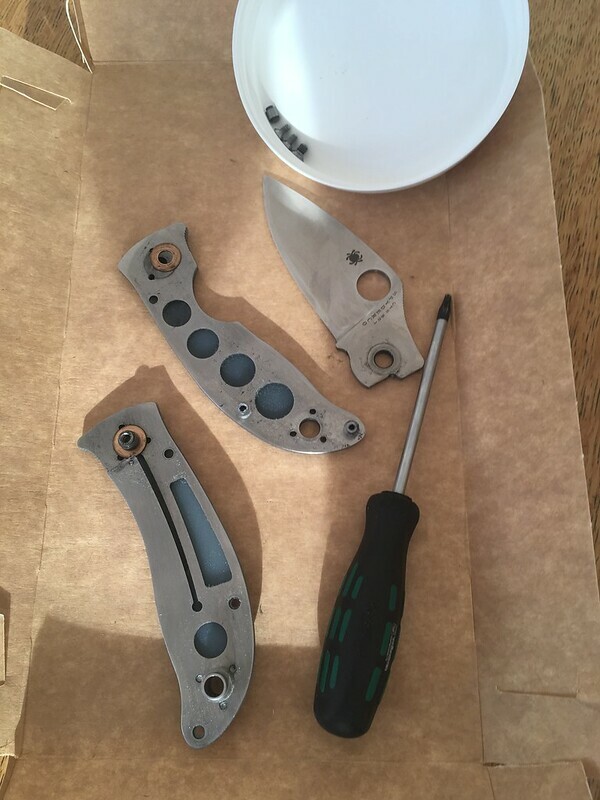 Even just a little pressure can be enough to force the detent to block or slow down the opening of the knife. From having handled the Mantra 2 previously I knew it was very sensitive to this as well. What I was looking to find out was how I would get along with this knife on a day to day basis. 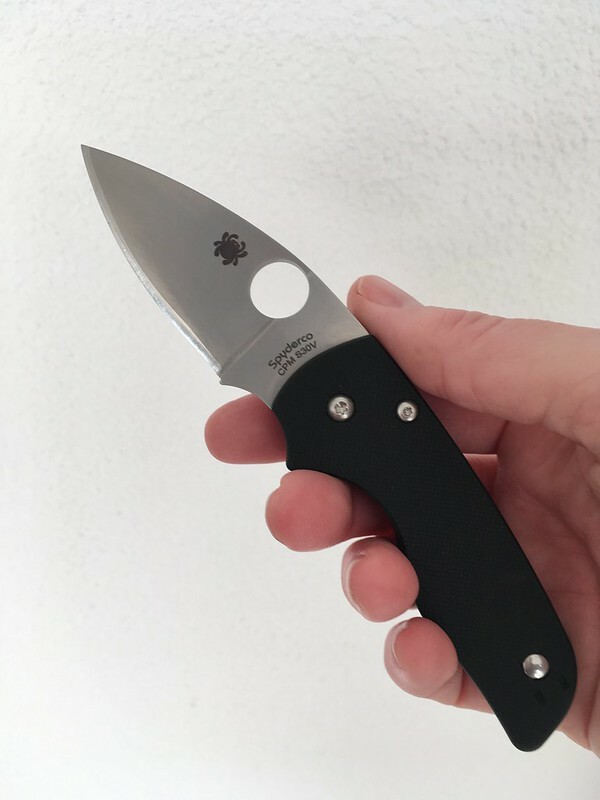 Would I adapt to the flipping and the handle with the flipper guard or would it just not work for me. After having sharpened it, very easy with an extra coarse DMT and the diamond side of the Fallkniven DC4, in to the pocket it went. First a few words about the flipping action of the Mantra 2. I would describe this as being light. 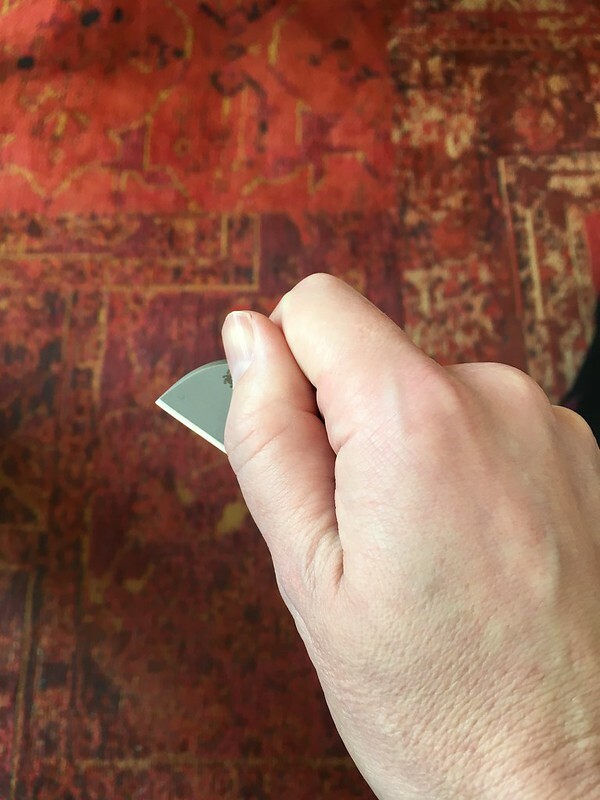 After having made sure that your fingers are not resting on the lock bar or on the front of the clip, little force is needed to shoot out the blade and have it lock with a reassuring click. Both the light-switch and push-button method of flipping are equally effective. Putting a drop of oil on the detent makes the opening and closing the knife noticeably smoother. 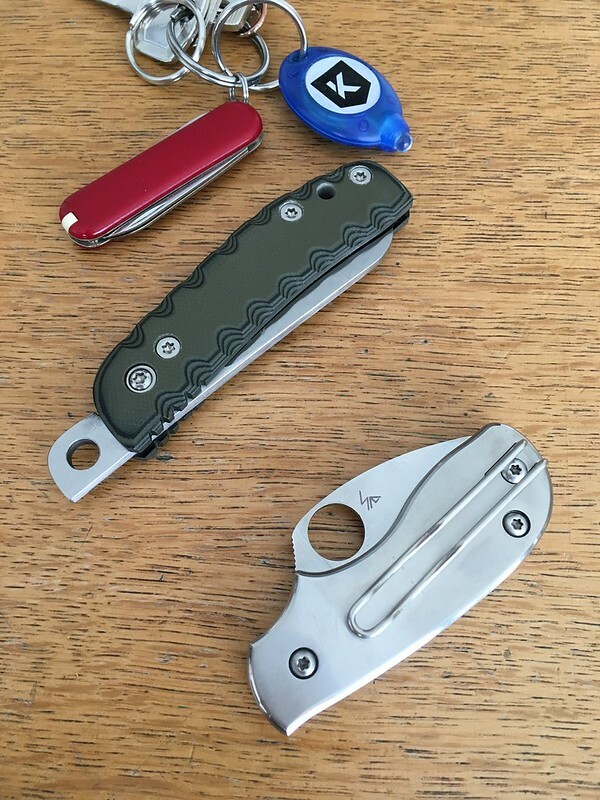 After having carried and used the Mantra2 for two weeks I got used to opening a folder with a flipper. When taking it out of my pocket I would feel if my fingers were in the right place, not pressing on the lock bar! and most of the time the blade would open fully the first time. Good fun! But not as intuitive and reliable as a hole opener. The handle worked well for me. Some hard cuts in cardboard revealed no pressure points. The flipper did not get in the way. And as there is no space wasted in front of behind the flipper guard I felt I had a lot of control over the blade. I can’t say much about the blade other than that it worked well for my use, mostly cutting cardboard and plastic packaging material. The edge was thin enough to cut well and the point pointy enough to pierce well. It was fun getting to get to know the Mantra 2! 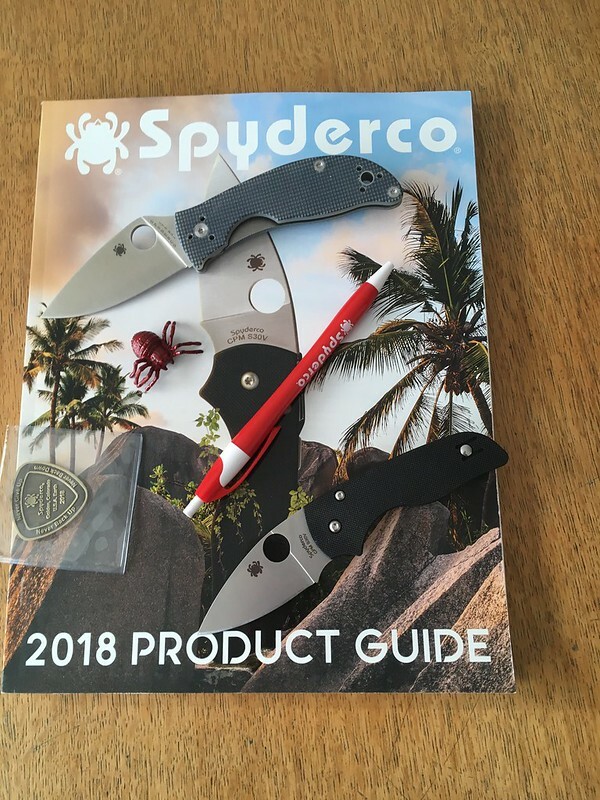 An excellent very day carry flipper from Spyderco! Recently I went to the Dutch Knife Exhibition (DKE) in Tiel. This is the only Dutch knife show and has been held for the last few years in the second part of April in Tiel. The DKE has a nice mix of handmade and production knives as well as knife maker supplies. 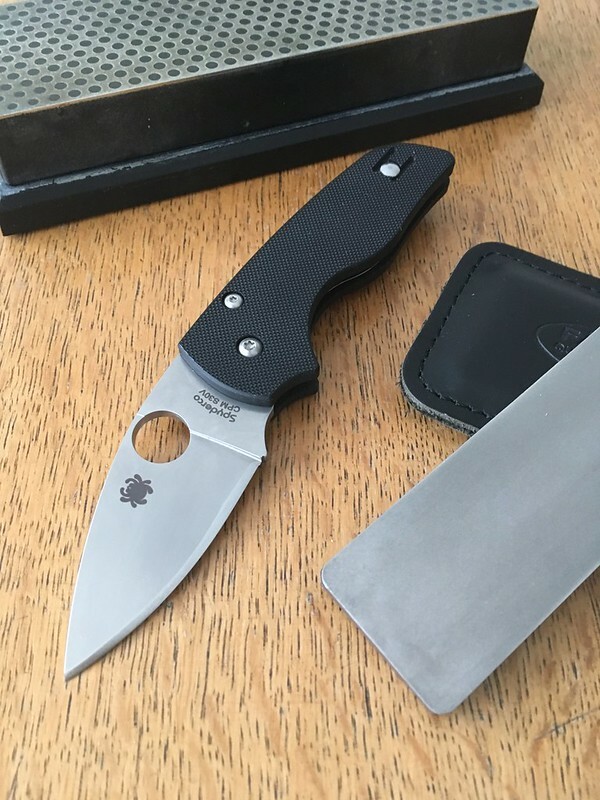 Before I went to the show this time I had in my mind that one of the thing wanted to check out were the friction folders by the Belgium knife maker Jan Dox. 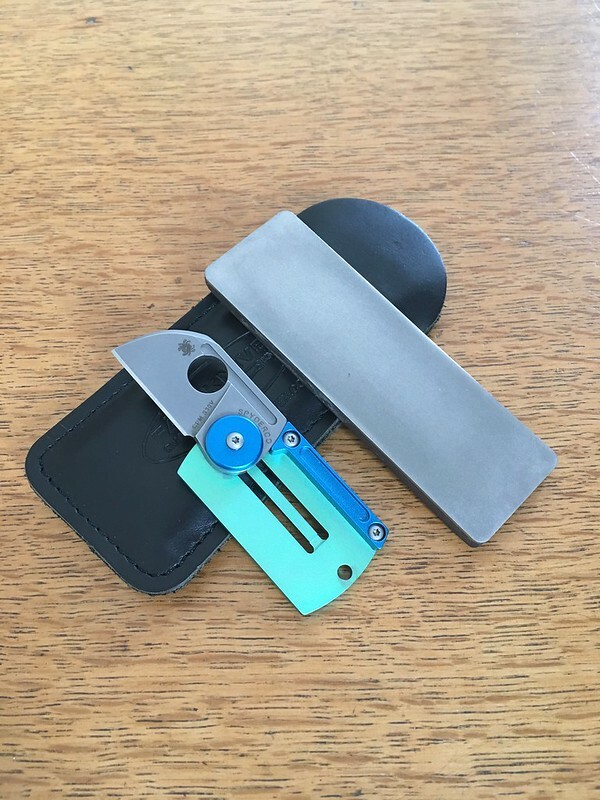 I looked around the show, stopped by Jan’s table and looked the friction folders over and talked a bit with Jan. Jan told me he carries one of his own friction folders as an EDC. I like it when a knife maker carries and uses his own knives. It shows they have confidence in their product. After I finished looking around the show I went back to Jan’s table and decided to buy the folder you see pictured here. 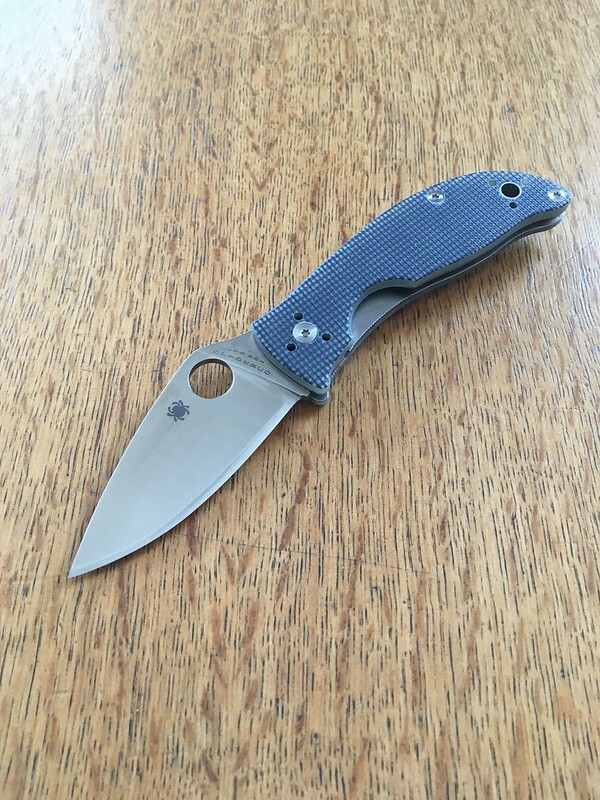 Let me tell you some of my first impressions of this knife. 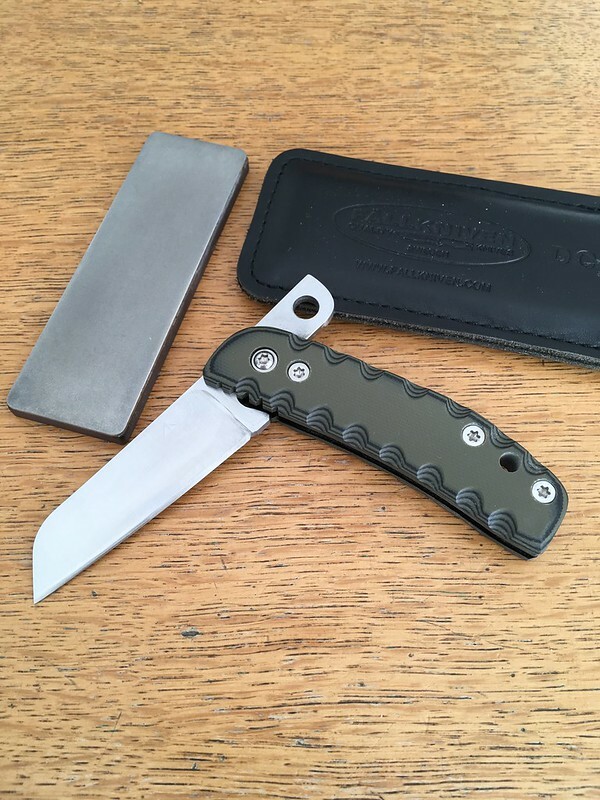 The G10 handle looks good and is nicely rounded, feeling comfortable in the hand. The opening and closing action is smooth but secure. I can open and close the knife with one hand but it does not feel loose. Should the amount of friction change over time, the pivot can be tightened with a torx 10 screwdriver to make it right again. 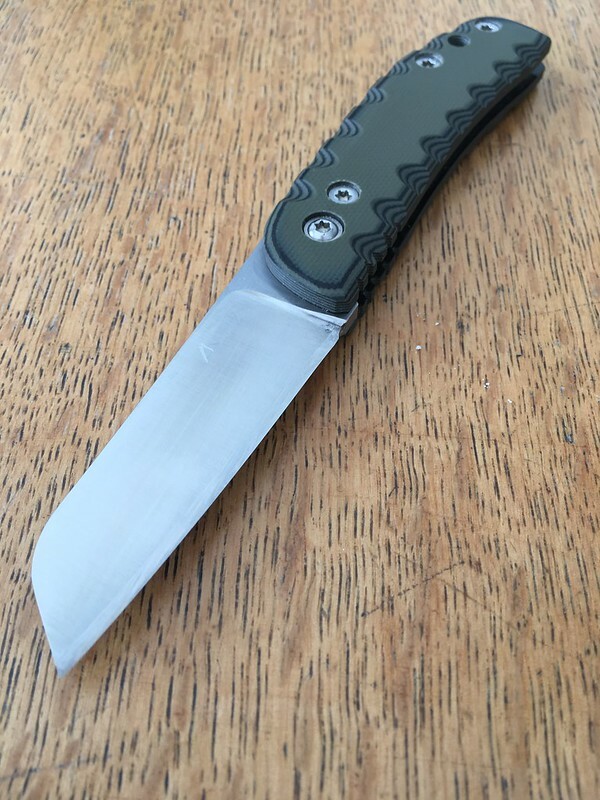 A lot of friction folders have a narrow tang sticking out when closed. Not something I would like to carry in the pocket without a sheath. And I do not like pocket sheaths much. 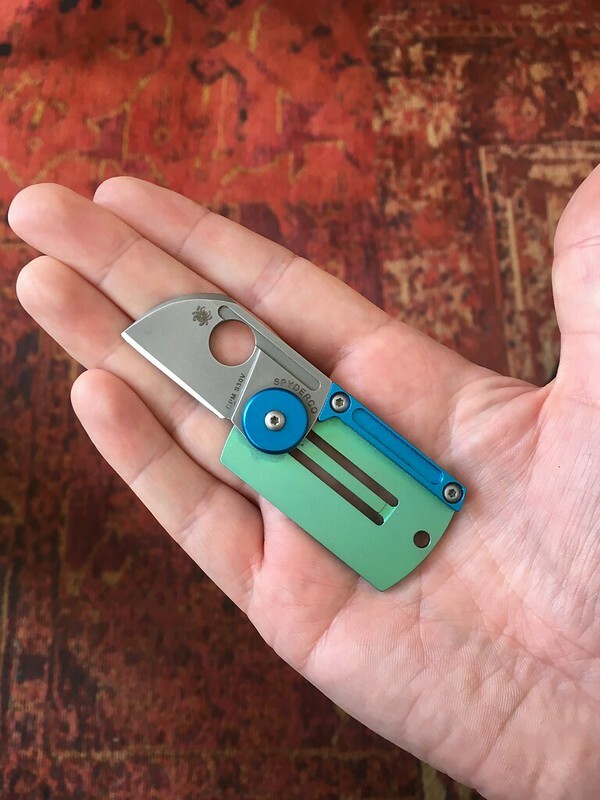 The friction folders Jan Dox makes have a wider but relatively short tang that is rounded on one side and can be carried in the pocket naked. That is how Jan Carries his and that is how I will carry mine. The edge it had new was not very sharp and had a small burr on the front halve of the blade. I think I had best look on this as: old fashioned style of knife, old fashioned sharpening paradigm! The maker puts on the edge bevels and the user sharpens it the way he wants. If you use it you have to sharpen it anyway. Besides, this was a very affordable handmade knife and I like to sharpen. Putting a fresh edge on this blade made out of D2 tool steel, was pretty easy. 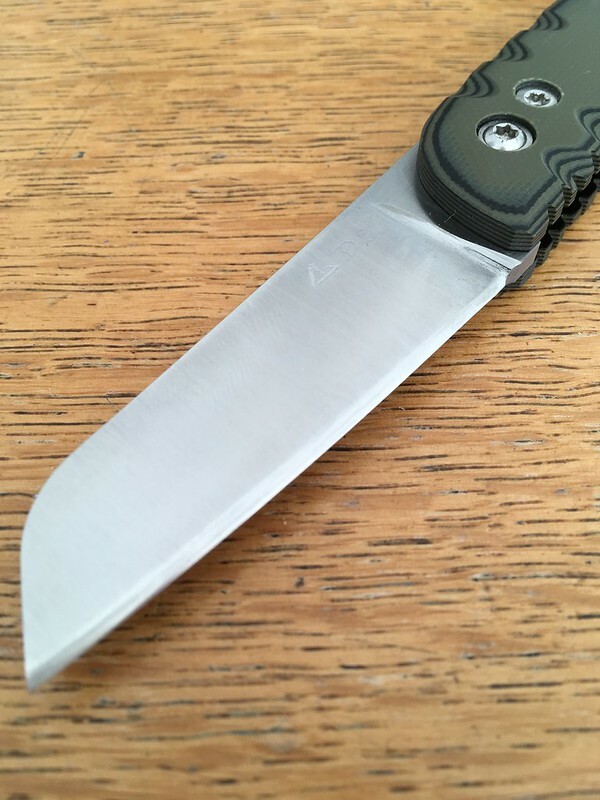 I used a Extra Course DMT to refine the edge bevels and then put the final edge on with diamond side of the Fallkniven DC4. Following this I cut up some card board just to see how it did. No complaints there! The blade went trough the material with little effort. After having cleaned the tape gunk of the blade with lighter fuel I sharpened it up to head hair splitting sharpness. 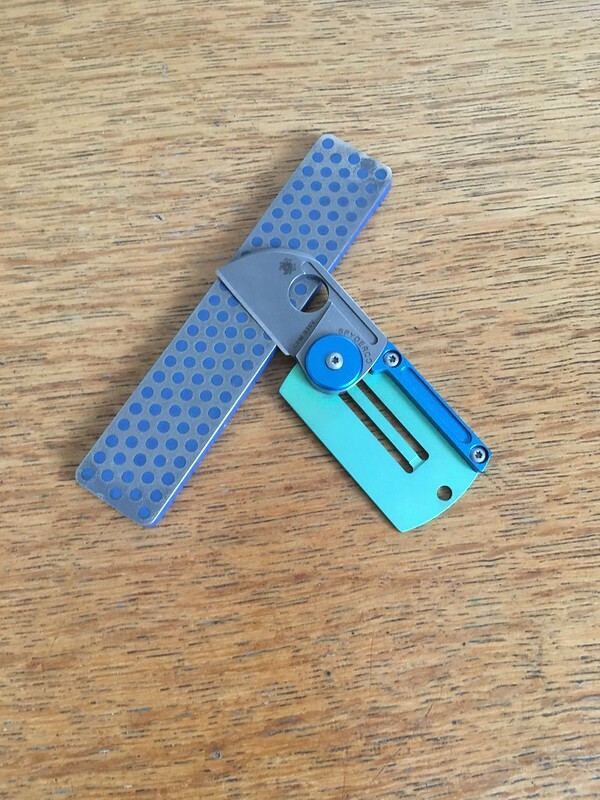 It is a pocket scalpel now! You can tell the maker took good care not to over heat the steel during fabrication. There where no nasty burrs to chase from side to side and a crisp, clean edge was easily obtained. All-in-all I am pretty happy with my purchase and look forward to getting some use out of my new knife! After having carried and used this knife for a while now I have found that it works well for me. 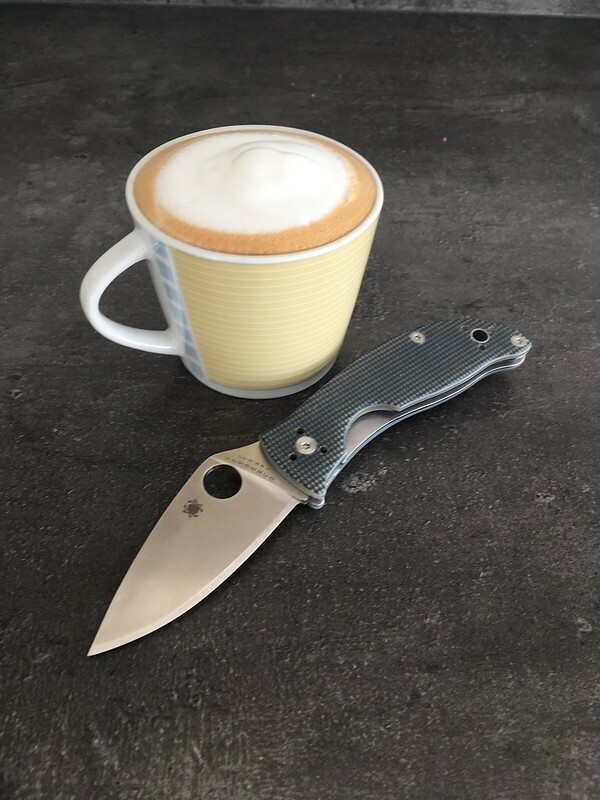 for most of that time it has been my main edc. I have cut paper, cardboard, plastic packaging material, as well as bread buns with ease. During this time the D2 steel has held its edge well and was easy to touch-up or resharpen when it lost some of its sharpness. I found it Very easy to get it head hair splitting sharp with just the diamond side of my Fallkniven DC4. There is enough friction between the handle and the blade to hold the knife open and closed but not so much that it is hard to operate. This means it can be opened (and closed) with one hand, which can be pretty convenient! 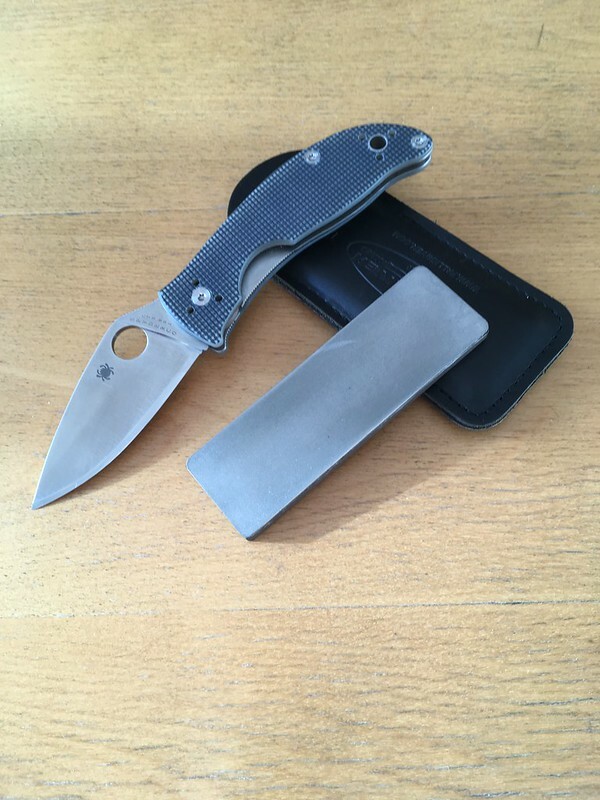 This is the first friction folder that I have carried and used and it has proven to be a very useful design that has been well executed. It does just what I like a pocket knife to do, and does it well!